Welcome to Camp Wonderopolis 2017! Start with the overall view of the Campground. Choose an area to explore or visit the Wonder Wall. Each area has seven Wonders to choose from, a Maker Activity to try, and great reading selections for all ages. 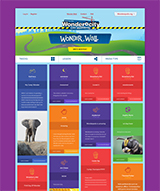 Each Wonder page has a video and media gallery, explanation of the Wonder, fun activities, the Wonder Word Wheel, and a quiz where you can earn your Wonder Card. Keep track of your Wonder Card collection on your dashboard. Counselors can select the My Campers tab to add Campers and keep track of their progress. Share your Camp activities and thoughts on the Wonder Wall, our virtual bulletin board!